EverSewn’s Charlotte model is one that I have been wanting to review for quite some time. Any time I look for this model, inventory is low. Consumers are flocking to this model for a reason – it’s impeccable in quality and functionality. When I started to do my research for this model, I was pleasantly surprised that I didn’t come across any notable complaints. This is because it is an all-around solid sewing machine. You’ll find ample features that are high-quality and a sewing machine that’s easy enough for beginners yet advanced enough for experts. When I am looking at computerized sewing machines, I want to make sure that they’re able to be setup quickly. A lot of consumers are turned off by “computerized” because they assume that they need to be technologically advanced. Don’t worry, EverSewn has made the Charlotte easy to setup and get started sewing. You’ve removed the unit from the box, placed it on a table and are waiting to use it. There’s an instruction manual that can help, but the setup is easy. You’ll find that there’s an automatic needle threader that saves you loads of time when getting started. There’s also a drop-in bobbin feature. Drop the bobbin into place and cover it with the clear cover plate. A clear plate allows you to visually keep an eye on the bobbin and replace the thread when it needs to be refilled. Some users complain that the threading system is quirky, so they will thread it by hand. Keep in mind that you have the freedom to move the needle up and down, so you can thread the needle faster and more efficiently. You’ll also enjoy the thread cutter on the side of the machine. When you’re done with a project, you won’t need to grab scissors – it’s a nice feature to have. And when you first get started, I do recommend reading through the manual. Large print and sketches make it easy to understand how to use your sewing machine. Descriptive tables are also included that make getting started with your sewing machine more intuitive. You can adjust the stitch width to 7mm, too. When you have a visual stitch indicator right in front of you, it’s impossible to forget the stitch that you’re using. What’s even nicer is that Charlotte includes a pull-out stitch library. What’s this library all about? The library is a reference and works to make your stitch selection faster. You can visually see all of the stitches available, and with 70 total stitches, you’ll always have the right stitch for your project. Standard stitches are available as well as decorative stitches, which make sewing fun again. Pull out your stitch library, find the right stitch for your project and the rest is history. It’s a breeze to adjust all of your stitch settings to meet your project’s needs. There’s a feed dog drop feature that quickly transforms your sewing machine into a quilting or embroidery machine. You simply lower the feed dog to be able to unlock free motion quilting. No matter your level of experience, you’ll be able to enjoy free motion quilting. Fast and efficient, you can adjust the unit’s speed with a push of a slider. It’s easy to adjust the speed, and you can just use your hands to guide the material. There’s a stop and start button for the unit, so you’ll be able to turn the unit on and off with ease. There’s never a need to use a pedal with the Charlotte. An up-and-down button controls the position of the needle, and there’s also an easy way to make buttonholes. You can make buttonholes in seconds. 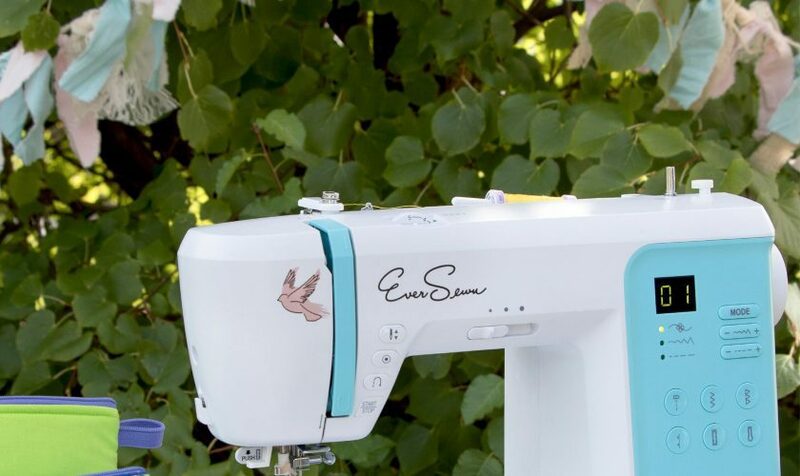 The sewing space is 6.5 inches in width, and EverSewn Charlotte also comes with seven presser feet to help you get started with sewing. When it comes to quality, this machine is impeccable. All if the components meet ISO 9001 certification requirements. The entire unit is tested thoroughly and ISO 9001 certified, but it gets even better than that. The frame consists of all metal, ensuring the durability of the unit. But just because the unit is made entirely of metal doesn’t mean it’s overly heavy. The weight of the Charolette is just 13 pounds, so it’s durable but not overly heavy. I almost forgot to mention that this machine is also very quiet. Yes, the motor is very strong and durable, but it’s very quiet, allowing you to sew and watch television, videos or anything else without getting distracted. The machine also offers bright lighting to ensure that visibility is never a problem when sewing. It takes some time to find the right thread tension, so you’ll need to play with the settings to find the perfect tension for your project. Button threads are a little loopy, but this is expected with most one-step buttonhole options. The loops won’t cause any problems, and the buttons always fit easily. Quality is where I found people are truly happy. The machine is made from an entirely metal frame which means it’s built-to-last. Metal frame machines are what your grandma likely used, and I remember my grandma having her sewing machine for decades. Metal, versus plastic, is far superior and guarantees that your sewing machine will last a long time. A variety of presser feet are included, and while some users state that they’re overwhelmed with the unit at first, it really is an easy-to-use sewing machine. The digital options are superb, and the instruction manual is very thorough. If you’re having trouble with the setup or using the machine, the manual will come in handy. Just like the Eversewn Sparrow I reviewed earlier, I really enjoyed reviewing the EverSewn Charlotte. This computerized sewing machine can double as a quilting machine, and it helps make a person’s sewing look more professional. Click here to view pricing and availability of the EverSewn Charlotte. Thanks got your review. I’ve been considering this machine but there is not as much information about the Eversewn maker/professional models as there is about the Sparrow line.